“Stash” filled in its now-patented “First Jam of the Run” slot, but did so with far more skyscraping psychedelia that usual. Representing the only first set launchpad, the band let things hang out early, forming the most demented segment of the night. Following the jam’s standard path for a while, there came a certain point when the band veered off course into uncharted waters. Navigating a stormy sea of musical whitecaps, the band reached their darkest and most abstract points of the night in a scintillating episode that couldn’t help but trigger memories of “Stash’s” sacred trek in the same room six years ago. A musical adventure that teetered at points, finally peaked in a cascade of cacophony. Following a first set that better resembled a mortuary rather than a Phish show, the band brought out their second-set defibrillators in the form of “Mike’s Song.” Sinking their teeth into the most gnarling version we’ve heard in a while, Phish passed through some sinister funk grooves before Trey let loose into a series of menacing guitar leads, narrating a twisting tale of darkness. Taking their head of steam and morphing into “Light,” the band seemed to almost get there a couple of times via their newest vehicle, but in the end fell short of any real greatness. After many of the stellar rides from fall tour, this “Light” just didn’t shine as brightly, but the band can’t be faulted for not pushing themselves, and that’s all we can ever ask. 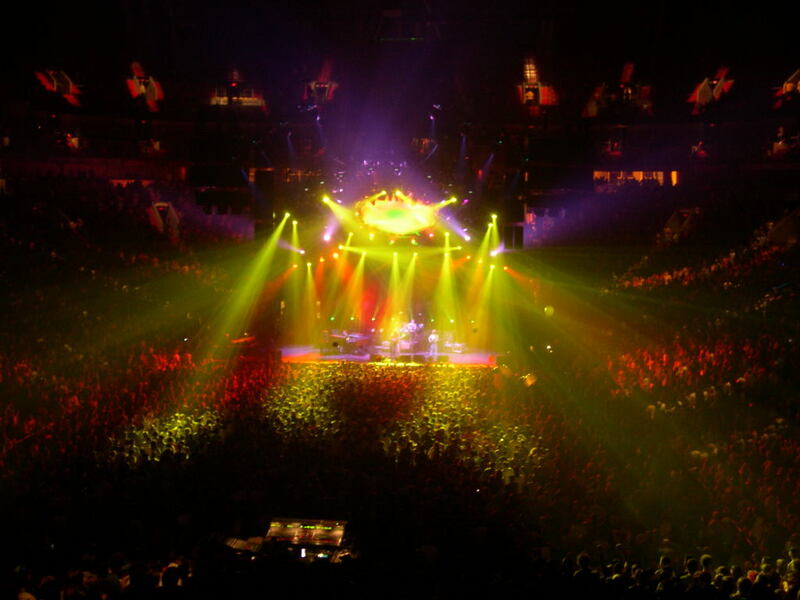 And push themselves they did once again in an experimental, near-twenty minute “Harry Hood.” Starting the jam in near silence, Phish built, plateaued, and emerged again, through a sprawling cycle of full-band interplay. Transcending its composed build, this “Hood” drifted into more than one engaging musical segment before reconnecting to the its triumphant theme. In the most salient musical moment of the evening, this “Hood” seemed to bring direction and coherence to the band’s improv, in earnest, for the first time, all evening. Another risk taken; but this time, the band came out smashingly successful. 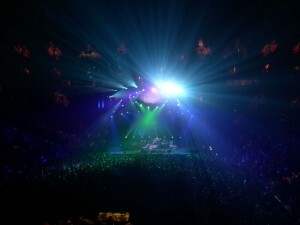 Despite the musical highlights, a noticeable lack of energy lent a strange vibe to a show that, at times, seemed like Phish was going at it alone. 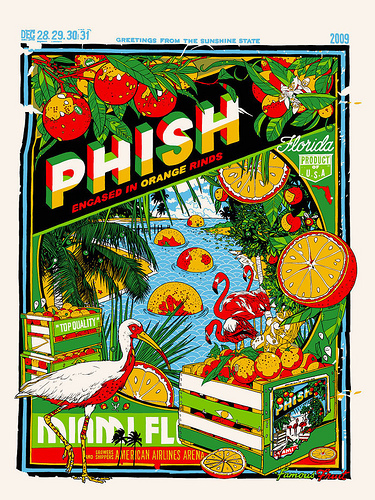 With virtually no one behind the stage, empty sections of seats on the floor, a black curtain quardening off much of the upper deck, last night felt like a complete juxtapostition to the through-the-roof energy that underlined fall tour; and hardly like a New Years Phish show. One must wonder what effect this feeling, if any, has on the band, their playing, and the their outcome of the show. After a first night that will, no doubt, be left in behind by the exploits of the next three, let’s come back tomorrow and see what’s up. “My Soul,” unplayed since the band’s first farewell at Shoreline 2000, and “Roggae,” unplayed in ’09, came out one after another in a combination that seemed clearly linked by their relative scarcity. “Undermind” provided the first signs of musical vitality to the show with its punchy rhythmic interplay, while “Beauty of a Broken Heart” took the momentum from “Stash” and split it over a platter of groove in an entertaining spin. Overall, the first featured a rather sluggish flow and mediocre song selection, resulting in an underwhelming set of Phish to start off New Years ’09. This entry was posted	on Tuesday, December 29th, 2009 at 5:32 am	and is filed under Uncategorized. You can follow any responses to this entry through the RSS 2.0 feed. Both comments and pings are currently closed. Chiming in late, after driving back to the hotel, but have to add IMO this show was perfection from start to finish. Simply amazing. They had the crowd rocking all night. If they pull this off two more nights in a row, I’m not gonna be able to do anything but lay on the beach for a week. Unfreakingbelievable. It sounded like the audience was into it. Sounded like great fun tonight. What page are the Cypress Downloads? Tonight was AMAZING! The 2nd set flowed like water, or better yet, melted butter. I was a little skeptical of Heavy Things too but they pulled it off beautifully. The crowd tonight was in complete synergy with the band. Everyone in that place ROCKED OUT hard. I hope Miner has more positive things to say because I am disappointed with his review of last night’s show. It was the first night of a 4 night run–of course they aren’t going to blow it out, and not every show is going to flow smoothly the way he likes. Roggae was sweet. The Makisupa was ridiculously good. I usually agree with Miner’s reviews for the most part but this one was off IMO. I think Trey just had a bad day, cause compared to his Fall Tour guitar playing, this is very different. what night we talking bout?. pardon me, but these lists are looking more and more dead like. jibboo>wilson>jibboo feels like a stella>sugaree>stella. different band, different band. Nope – none of the jams of night one grabbed me. Rehearsal mode all the way though. They try to go different ways and just let go, but there’s a lack of focus and communication. Anyway, still a great Rock concert, but one bad Phish show. But I wasn’t there – we all know that makes a huge difference. Well, that Tweezer was rather enjoyable, having snagged a nice aud rec in the early morning hours. Not sure about the zzyzx “Manteca jam” but if that’s what PHiSH calls it, I’ll take it. It’s a day late for bday celebration, but perhaps further validation that “they” read “us.” — at least it’s validation in my mind. Still waiting for the real deal; I want to look in my shoemouth for crabs. Me thinks Mongo and Dizzy would be pleased. But, at the Manteca-esque lick, eleven minutes and twelve seconds in…from that point to the end and into the Prince…well, it is just beautiful music. Haven’t heard them go in that direction this year. Lovely, creative finish to that one. Such a nice cap to our shameless seven course vegetarian + vin tasting at Upstairs on the Square. Shameless. Economy be damned! signing off for life i knew i should not have looked at this CRAP!!!!!!!!!!!!! Some nerve you have Miner, I told you you needed a break!!!!!!! Bye, Bye, Panda. Just opinions, not daggers. Did anyone mention the final vaccum solo of the decade? Just woke up. Took a peak at last night. Wow, some real rare stuff played. Happy new year and thanks mister minor! Really surprised about no mention of the roggae in the meat!! That was one of the most melodic flowing jams of fall tour!! You can feel Trey open up! A ton of passion there!! Powered by WordPress v 5.1.1. Page in 0.873 seconds.